If you want to minimize the pore size on your face, there are several ways to shrink the appearance of pores. The right skin care regimen, including regular exfoliation, can help. Enlarged pores contribute to a variety of skin challenges including visible pores, uneven makeup application, increased breakouts and loose, untoned skin which can be unsightly. Unfortunately, once pores have enlarged, there's not a permanent or effective way to reduce them permanently. The only methods of treating pore size are through minimizing their appearance and preventing future pore enlargement and skin changes by a regular skincare regimen designed to keep pores clear. Masks: There are a multitude of over-the-counter masks and deep cleansing treatments that treat skin and clean embedded dirt and oils, which eventually enlarge pores. A facial mask should be used once per week in order to best reduce pore size. Steam: Steaming the facial skin is a wonderful way to open up the pores and remove the dirt and debris that is clogging them. For a do-it-at home steam session, place your head over a pot of hot water with a towel draped over the head and the shoulders. Be careful to avoid hot water burns. Steam the facial skin for five to ten minutes. Follow with a light moisturizer. Exfoliating the skin with a gentle scrub removes dead skin cells and debris that can commonly clog pores and enlarge them. An exfoliant or facial scrub should be used after the cleanser once or twice per week. Many scrubs use natural ingredients, such as salt or sugar, and work to remove surface skin in a gentle and effective manner. Exfoliation is key, and there are several methods of exfoliation that will work to both clean out your pores and reduce the number of dry skin cells that hold onto the edges of the pores, which makes the openings appear larger. Microdermabrasion: Microdermabrasion will remove the outer layer of skin and, with the help of suction, help clear away the blackheads that cause the appearance of enlarged pores. This is one of the more expensive methods for decreasing the appearance of large pores and often involves making an appointment with a professional. Microdermabrasion has also been shown to improve collagen production and fight large pores from an anti-aging standpoint. 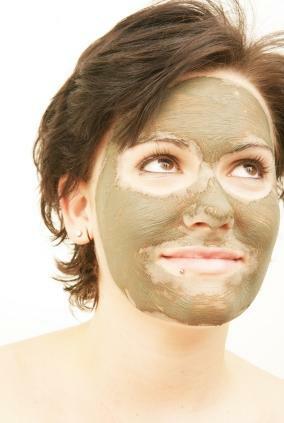 Home facial scrubs: Make sure you get a facial scrub with round beads in order to avoid tiny tears in your skin. You may also use a damp washcloth with your regular facial cleanser. This will remove the dry skin that collects around the edges of the pores and makes them look deeper than they are. CosmeticsCop.com reports that this method of exfoliation isn't as effective as others because you only have access to the very top layer of skin when you use a scrub or a washcloth. AHA: This is a type of chemical exfoliant that works well for dry or sun-damaged skin, and it is available in more than one strength. AHAs are used to dissolve dead skin cells on the surface of the skin and supply some moisture, though they don't replace a normal moisturizer. An example of an AHA, or alpha-hydroxy acid, is glycolic acid. BHA: According to CosmeticsCop.com, BHA is ideal for those with oily, acne-prone, or very sensitive skin that turns red easily (as with rosacea). It cleans the pores from the inside out and works through the oil that's clogging the pores, which makes them appear smaller. Toning the skin after cleansing or exfoliating is an excellent way to close the pores and tighten the surrounding skin tissue, reducing the visibility of clogged and enlarged pores. A simple astringent or alcohol based toner used liberally after cleansing or exfoliating will help prevent enlarged pores. For a quick fix, you can also use cold water. This is a temporary solution, but if you have a special date or event and want tightened pores for a few hours, rinsing your face with very cold water will tighten the pores and make them less noticeable. Although many people suffering from enlarged or clogged pores worry that lotions and moisturizers may clog the pores, the opposite is true. Properly moisturized and supple skin produces less natural oil. For those suffering from oily skin, moisturizers are the cure. 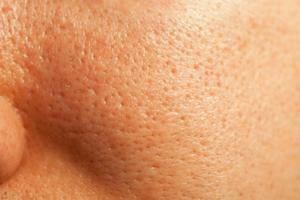 Facialists and estheticians are able to treat the condition of enlarged pores and help minimize their appearance. A salon or spa visit with a professional is a wonderful way to seek advice and treatment options for enlarged pores. Professional microdermabrasian, facials, and deep cleansing are available at many salons. According to skincare expert Renee Rouleau's blog, pore size is determined when you're a teenager and is based on how oily your skin is. Those with oily skin all over will have larger pores, those with oily T-zones will have larger pores in that area, and those with dry skin won't have very large pores at all. As time goes on and the skin loses its elasticity and tightness, however, pore size may seem to increase. The skin isn't pulled back as tightly anymore, so the indentations in the skin become more obvious. The pore size can then be exacerbated by dry skin holding onto the pores or dirty pores in general. The key to minimizing pore size, then, is to exfoliate regularly and keep the pores oil-and-dirt-free. None of these methods will actually shrink the size of your pores. However, they will minimize their appearance and give the illusion of smaller pores, but it is impossible to actually decrease their diameter. The right choice for your needs depends on your budget, time constraints for appointments or the skin care regimens that involve AHAs and BHAs, and other skin issues you may have such a rosacea, oiliness, or sun damage. Be sure to only try one new product per week so that you won't overload your skin. If you do have a reaction, you'll know which one to eliminate from your routine. With patience and effort, your skin will reap the rewards and look clearer and feel softer.